What do #ARKidsNeed from birth to age eight? Home > Publications > What do #ARKidsNeed from birth to age eight? Expanded access to health care. Moms who have quality prenatal care. Regular check-ups to catch health issues early. Mental health care from certified providers. Quality pre-K and early childhood education. Parents who teach early literacy by reading and talking. After school and summer programs. Home visiting to fill in the gaps. Financially stable households (Earned Income Tax Credit and Temporary Assistance to Needy Families). Healthy food from the Supplemental Nutrition Assistance Program (SNAP). Parents who have access to paid leave. Decades of research show the first eight years of life are the most important for healthy brain development and success in school. Without a coordinated effort to nurture all of our kids during this time, many of our youngest Arkansans will continue to struggle while their peers excel. Unfortunately, too many of our kids aren’t getting the boost that they need for their healthy growth and development, especially during the most critical developmental stage: birth through age eight. Many of our infants and toddlers have vocabularies that are half as large as their peers’. Too many of our elementary school students experience summer learning loss and start a new school one year behind their classmates. Too many of our third graders are still learning to read while their peers are reading to learn. Supporting kids also means making sure the whole family is financially secure. Arkansas is among the 10 worst states for child well-being and has some of the lowest opportunity for African American children, according to research by the Annie E. Casey foundation. This is largely because more of our kids live in poverty than almost any other state. Families with access to financial support services like tax credits, TANF, and SNAP are better prepared to provide a stable and nurturing home life for their kids. The good news is we can erase the word gap, forestall summer learning loss, and ensure that all third graders are reading at grade level by the time they leave third grade. We can ensure that all children are healthy, happy, and ready to learn. What would this look like in Arkansas? This report examines the major policies that are key to giving all children a strong early start: health, education, and economic security. The first eight years set the foundation for future development. The first eight years set the foundation for future development.1 Over the past two decades, Arkansas has made considerable progress increasing health care coverage for children. This is largely because of efforts to enroll eligible children in ARKids First, Arkansas’s version of Medicaid and the Children’s Health Insurance Program (CHIP). When the ARKids First program launched in 1997, about 22 percent of children in the state lacked access to coverage. By 2014 this figure was down to 5 percent. 2 Also, young children under age 10 are much less likely to be uninsured in Arkansas. The cost of health coverage is a common barrier for families. Medicaid and CHIP provide an affordable option for families when coverage is out of reach. 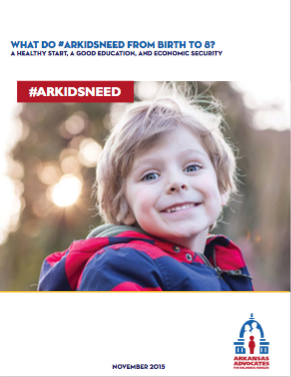 In Arkansas, more than half of our children get coverage through ARKids First and more than 66 percent of births are paid for by the Medicaid program. 3 Because of our success in enrolling children in ARKids First, low-income kids are now insured at about the same rate as other kids, but gaps in coverage remain: children do not always maintain coverage as they get older. While we’ve made huge gains in covering children, ensuring access to care is equally important. High-quality care before birth and during a child’s early years is crucial. Prenatal care is key for healthy newborns. The majority of births in the state are covered by Medicaid. And many pregnant women qualify for care during their pregnancy and up to 60 days after the baby is born. Since Arkansas expanded coverage under the ACA, women account for about 58 percent of enrollees in the Private Option program.5 Extending coverage to more women can reduce premature births and improve prenatal care. Infants born early are at a greater risk for serious health problems.6 This is especially important, since 12.7 percent of babies in Arkansas are born preterm. Prevent low birth-weight and birth defects. Promote healthy behaviors among women of child-bearing age, so they will be healthy before they become pregnant. Improve health management and parenting skills of parents. Expand home visiting and other parent education programs. Increase access to quality health care during and after pregnancy. Reduce the rate of late pre-term deliveries. Improve quality of neonatal hospital care. Ensure access to high quality health care for babies with special needs. In 2013, the Arkansas Department of Health launched a new automated system that allows providers and schools to track a child’s immunization history and adherence to the required schedule. Of note is the fact that philosophical exemptions are on the rise in Arkansas, but still isn’t alarmingly high. Tooth decay is the most common chronic childhood illness, and is one of the greatest unmet health care needs for children under 8 years old. Tooth decay is the most common chronic childhood illness, and is one of the greatest unmet health care needs for children under 8 years old.10 It has been associated with difficulty eating, sleeping, learning, and in maintaining proper nutrition. According to an Arkansas Department of Health report, 64 percent of third graders have experienced tooth decay.11 This issue is exacerbated for the most vulnerable Arkansans who often have poor access to dental treatment, some due to geography and others due to income. In 2011, legislation passed that significantly expanded the number of communities that would have fluoridated water systems in the state. Water fluoridation reduces dental decay by 30-50 percent for children and adolescents.12 There have also been successful efforts to expand pediatric dental treatment to all parts of the state. Arkansas Children’s Hospital (ACH) operates three mobile dental clinics that provide services to about 2,000 children each year.13 ACH has also provided treatment to over 6,000 children since 2009 through the dental sealant program resulting in an increase of 73 percent of children aged 6 to 9 with dental sealants. In the first year: Newborn, one month, two months, four months, six months, and nine months. In the toddler years: 12 months, 15 months, 18 months, and 24 months. In the preschool years: annually, at ages 3, 4, and 5. In the elementary years: at ages 6 and 8. Starting at age 10, annual screenings. In addition, the American Academy of Pediatrics also recommends a visit at three to five days after birth, at 30 months, at 7 years, and at 9 years. For Arkansas children, screening rates have remained below the national average. As children get older, they are less likely to get screenings. Science tells us that the foundations of sound mental health are built early in life. The Arkansas Building Effective Systems for Trauma (AR Best) is one program that is addressing the need for additional training for professionals to treat young children. Housed at the University of Arkansas for Medical Sciences, AR Best provides treatment, training, advocacy, and research for children and families impacted by trauma. Almost 700 clinicians were trained between 2009 and 2013, and the program has provided services to over 300 children to address trauma issues. Promote the positive social and emotional development of children through changes to the early learning environment. Decrease problematic behaviors of young children in the child care setting by increasing the skills of child care providers and family members. In 2013, the program provided 679 consultation site visits, trained 90 teachers, and improved teachers’ interactions with children and improved children’s behavior. Despite this success, Medicaid is unable to reimburse for these services. Finding a sustainable funding source is a necessity to ensure that this support for our families can continue. The most at-risk families should be supported with services designed to keep families together. Younger children and their families should be fully represented in state cross-systems initiatives to support mental health. Evidenced based screenings for social-emotional problems in young children and serious family risks should be expanded and referrals to appropriate services should be enhanced. Early childhood mental health care providers and early care and education providers should receive the supports necessary to improve child social-emotional outcomes. Public awareness of the mental health needs of young children should be increased. Access to care can be complicated, especially when grandparents or other family members take on the role of primary caregiver. More than one-third of children raised by a grandparent do not have access to health insurance.18 That’s why it’s essential that simplified enrollment and renewal strategies are tailored to all of our families. This way we can alleviate costly breaks in coverage. This short video describes the need to focus on building the capabilities of caregivers and strengthening the communities that together form the environment of relationships essential to children’s lifelong learning, health, and behavior. Health care services in school-based settings are also an effective way of expanding access to care. Research suggests that children have increased access to immunizations, physical exams, and treatment for specific illnesses in a school-based health center (SBHC) regardless of their health insurance coverage status.19 And they increase access to care, especially for low-income children. Additionally, SBHCs models exist that provide health care services for the entire family. There are currently 26 SBHCs in Arkansas and the number of sites is growing every year. These health centers provide a full range of physical health services, some provide mental health services, and about 11 percent of the sites provide dental services. Moving forward, more resources should be dedicated to SBHCs in early childhood education settings. A 2011 study of nearly 4,000 students documented the impact of reading proficiency on staying in school. Almost all (96 percent) readers who were proficient in the third grade graduated from high school. Four times as many non-proficient students failed to graduate by the age of 19. And nearly one in four (23 percent) below-basic readers failed to obtain a high school diploma by 19. Improving the Arkansas high school graduation rate could have a significant economic impact. According to a 2013 report, the high school graduation rate in Arkansas was 71 percent in 2012. If the state increased that rate to 90 percent, 7,200 additional students would have graduated. The economic benefits to Arkansas would include $64 million in increased earnings accompanied by a $4.9 million boost in annual state and local tax revenue. How are we doing in Arkansas? We have some work to do. The good news is we can make improvements. Here’s where our fourth graders currently stand on one measure of grade –level reading. A bit about the data: the National Assessment of Educational Progress is given to a statistically significant number of fourth graders across the United States every other year. It is a test whose results can be compared across states, but is not a test that all Arkansas fourth-graders take, nor is it aligned with the Common Core. For our purposes, as Arkansas transitions from Benchmark testing through PARCC testing and into ACT Aspire testing, NAEP will be the consistent source of data by which we can measure our upcoming year-over-year progress. A vast amount of brain development occurs from birth to age five. Our earliest experiences form the foundation for all of our future learning, they provide the ‘wiring’ that we use to learn how to read, how to critically think, how to set and reach goals, and how to adapt to new situations. Not only do our brains get wired for learning in these early years, but data shows that the quality of early childhood development strongly influences health, social, and economic outcomes. There is no stronger argument for quality pre-k than its impact on brain and childhood development. This is what happens in a quality classroom! But if you think you need one, a recent study by the National Institute for Early Education Research shows that the state of Arkansas would save over $26 million by 2030 by investing in quality pre-K for the 4-year-olds who qualify for and aren’t currently served by our quality program. Just think of the savings that would accrue if early childhood education was available for everyone. Arkansas’s two publicly-funded pre-k programs include the state-funded Arkansas Better Chance (ABC) program and the federally-funded Head Start Program. The ABC program consists of two programs: the original ABC program, established in 1990 serves children from birth to age 5 with a variety of risk factors with annual funding of about $10 million. Added in 2004, Arkansas Better Chance for School Success (ABCSS) program targets 3- and 4-year-olds in families of four who make below $48,500 per year. Our quality ABCSS program last received a funding increase ($40M) in 2008 to increase access and quality. Since then, there has been no substantial increase to address quality; when funding holds steady and costs increase, quality suffers. We need to continue to invest in the quality of our program in order to see the substantial educational, social and emotional gains. The one-time increase of $3 million in the 2015 legislative session is just that: one-time money, which cannot be relied on to make the necessary ongoing improvements for quality. The Head Start program in Arkansas serves children and families from birth through age four in one of two ways: Head Start serves three- and four-year olds while Early Head Start is for children from birth to age three. Our Arkansas program has been extensively studied by both the National Institute of Early Education Research (NIEER) and the Arkansas Research Center (ARC). The NIEER study followed the same group of Arkansas students beginning in the 2005-2006 school year. Researchers found that children who attended ABC showed improved scores in vocabulary and math through the second grade. They had improved scores in literacy through the third grade, and they fared better in the study than children who did not. The ARC study showed that pre-K is helping to close the education gap between low-income students and their more affluent counterparts. It also showed that children who attended ABC were more prepared for kindergarten than children who did not attend. Children attending ABC programs are Kindergarten ready – a key indicator to reading at grade level at age 8. As well as evaluating our ABC program, NIEER compiles an annual assessment of state pre-K programs. Arkansas’s program has continually received a 9 out of 10 on their quality standards checklist. This year only four states achieved a 10 out of 10 and only 6 other states scored a 9. As we know that the quality of programs is what drives positive outcomes, this achievement is meaningful. A broadly read and referenced publication, Education Week, has also recently released their 2015 Quality Counts report with a focus on Early Childhood Education. The results are a mixed bag for Arkansas. While we rank 1 in the nation in the number of students attending full-day pre-k, we are seeing both declining enrollment (ranking us 46 in the nation) and an enrollment gap between students in poverty and students not in poverty that ranks us 20 overall. To address the issue of quality in all child care settings, the state established the voluntary Better Beginnings rating program. Better Beginnings provides childcare providers with tools to become quality programs. It also provides parents with information about what quality looks like. Beginning in 2016, in order to receive Child Care Development Fund childcare assistance funding, centers must be certified in Better Beginnings at level one or higher. The state is making strides to ensure that all children have access to quality early care. Here’s how Arkansas stacks up on 3- and 4-year olds NOT enrolled in pre-k compared to the nationwide average. Keeping in mind all of the great outcomes for pre-K, we need to think again about how we can support quality pre-K for every child. See appendix for more on the importance of 0-3. Research tells us that pre-schoolers whose parents read to them, tell them stories, sing songs with them and engage in other literacy activities on a regular basis tend to develop larger vocabularies, become better readers and perform better in school. In fact, the link between early literacy and later reading success is so strong that there is a tight correlation between children’s vocabulary at three years old and their reading level in third grade. In Arkansas, 47 percent of parents or family members read to their child each day while 58 percent tell stories and sing to their children aged 0-5. While these numbers compare favorably with the national averages of 48 percent and 59 percent, many more of our children can benefit from reading, singing, and story times. The Arkansas Grade-Level Reading Campaign is working to generate support for a ‘talk campaign’ — a campaign to encourage all parents to read, talk, and sing with their young children, to increase their word nutrition. Ready Rosie is a great example. Ready Rosie helps parents help their children. The value is obvious. When 29 percent of our children from birth through age five live in poverty (that’s $23,850 or less in income each year) and when campaigns in other cities and states have shown promise and progress, it’s time for Arkansas to invest. Talk With Me Baby. Talk With Me Baby aims to transform parents and caregivers into conversational partners nourishing critical brain development. To achieve their goal of reaching all newborns in Atlanta by 2017 and all newborns in the state by 2020, Talk With Me Baby is training nurses, preschool educators, and WIC nutritionists in language nutrition coaching. In Georgia, more than 99 percent of expectant and new parents and their children are seen by nurses, more than 80 percent of low-income expectant and new parents and their children are seen by WIC nutritionists. And more than one-third of children from 0-3 attend an early childhood education program. Providence Talks. The City of Providence, Rhode Island is using home visitation programs and an innovative ‘word pedometer’ to track how many words are spoken by caregivers of young children. The caregivers receive the information in bi-weekly coaching sessions that include strategies and resources (such as information on library story times) for improving the quantity of spoken words. In one pilot study, parents have increased the number of words spoken to their children by 55 percent. Talking is Teaching in Tulsa. A part of the Cities Strategy of the Too Small to Fail initiative, Talking is Teaching is devoted to empowering parents and caregivers as their child’s first teachers. They have learned through focus groups that “while parents understand that they influence their children’s early learning, they often underestimate (or sometimes, don’t believe) the idea that they are their children’s first teachers.” Throughout the Talking Teaching campaign, they are working to show parents and caregivers that being a teacher means being someone who has an enormous positive influence regardless of setting or training. They are empowering parents to have meaningful interactions in nurturing environments during the first years of their child’s life. Parents are learning that describing objects seen during a walk or bus ride, singing songs, or telling stories for just five minutes can significantly improve a baby’s ability to learn new words and concepts. Arkansas can benefit from the experiences of parents and caregivers in these programs when starting ours. Low-income students are more likely to experience summer learning loss than their higher income peers. They have less access to educational opportunities in their homes and communities. Looking closely at the chart above shows us that at the beginning of the third grade, lower income students could be as much as 2 years behind their higher income peers. Summer learning loss can have compounding effects on academic achievement – if a student is already struggling with learning to read, a summer setback can make it that much more difficult for the student to be reading to learn by fourth grade. The gap in out-of-school activity participation, at the national level, between low-income 6- to 11-year-olds and their non-low-income counterparts was 27 percentage points in 2011-12. That gap is a bit larger in Arkansas for 6- to 11-year-olds at 31.1 percentage points. Out-of-school time is a time that many parents struggle to cover; quality after-school programs would not only ease the minds of parents, but would create a positive, learning atmosphere for students, which could help erase learning lags. Here is a great video by the Wallace Foundation on the importance of after-school programs. How can we address summer learning loss and fill out-of-school time during the year? We have the framework! We lack the funding. The Positive Youth Development Act builds on the standards, practices, and goals resulting from research of the 2008 Governor’s Task Force on Best Practices for After-school and Summer Programs. The task force called for expanded access to safe, challenging, engaging, and supervised learning experiences. It was subsequently passed by the Arkansas legislature as Act 166 of 2011 and laid out a structure for the use of state funds for grants to local communities to operate high quality after-school and summer programs. The rules for the program were approved in July 2013, but efforts to secure state funding for pilot programs have been unsuccessful. If funding was available, priority consideration would go to a community where any local school (a) has 50 percent or more students eligible for free and reduced lunches; and (b) has been designated by ADE as being in school improvement. The program would serve children and youth ages 5 through 19 who are members of a family of four with a gross income of less than $48,500. Higher-income families could participate by paying a fee based on income. A key element of the program is to foster community engagement and collaboration among schools, public institutions, private agencies, business, and other community-based organizations. These institutions should work together to create a “community learning environment” for students. In other words, the program is designed, in part, to support students most at-risk of not reading to learn by around age 8. Home visiting is the broad category name for a network of voluntary, primarily home-based programs available to expectant mothers and families with young children. Kids don’t come with instructions. So home visits cover everything from maternal health to child development and school readiness. The home visitors are qualified in everything from child health to early literacy and help new and expecting parents navigate the parenting highway. Home visiting is particularly valuable to low-income and rural families who often have little access to services and resources. A decrease in the incidence of low birth weight babies by nearly half, which means healthier babies and lower health care costs for families and state and private insurers. A sharp decline (almost by half) of instances of child abuse and neglect. A test score leap accompanied by an increase in critical pre-literacy. New research specific to Arkansas Home Visiting programs is required by Act of 528 of 2013. The Act mandates that home visiting programs track and measure outcomes such as improvements in maternal and infant health, family self-sufficiency, and school readiness. Outcomes must be measured for all state-funded programs. Stronger Families, Brighter Futures (the Arkansas Home Visiting Network) is a collaboration of all of the various home visiting programs operating throughout the state. Coordination between the programs was supported in Act 528 of 2013. We will soon have even more robust Arkansas data from which to share the meaningful results of home visiting; we can expect the report required by Act 528 of 2013 in the fall of 2016. Early Steps to School Success. Arkansas is among the worst in the nation for child poverty. Arkansas is among the worst in the nation for child poverty. In Arkansas, nearly 60 percent of children under nine years old live in families below 200 percent of the poverty line (or around $32,000 a year for a single mother raising one child).22 The national rate is much lower at 47 percent. Younger age groups in Arkansas also face poverty levels at rates much higher than national averages. A third of children aged 5 or younger were living in poverty in Arkansas in 2013. That number is well above the national average of 25 percent. Only two states, Mississippi and New Mexico, have higher rates of child poverty for that age group.23 Children under 6 in Arkansas are also less likely to have one or all of their parents working compared to national averages. Eleven percent of kids under 6 years old in Arkansas don’t have any parents who are employed (that number is 9.5 percent nationally). The Earned Income Tax Credit (EITC) is a federal program that helps low-income families keep more of what they earn. The EITC program is widely regarded as the most powerful anti-poverty and pro-work policy tool ever introduced. EITC eligibility is based on several of factors like income, age, marital status, and family size. The median adjusted gross income for eligible filers in Arkansas is about $14,400 a year. The working families who are eligible for the federal EITC in Arkansas already pay a much higher share of their income to state and local taxes than the wealthy. In fact, Arkansas has one of the most unfair tax structures in the nation. The top 1 percent of taxpayers (those making over $330,000 a year) have the lowest state and local tax burden of any income group. They pay less than six percent in taxes as a percent of their income. The lowest 20 percent of taxpayers (people making less than $16,000 a year) pay 12 cents on every dollar. That’s twice the rate as their wealthy neighbors! Much of this imbalance is because our state budget relies too heavily on sales tax revenues, which hit low-income people the hardest. A state EITC is the most efficient, targeted way to help correct our unfair system. Nick Hanauer is a “one percenter”, an entrepreneur, and an investor that has founded or financed over 30 companies including Amazon.com. He knows that a strong consumer base is what grows business. Transitional Employment Assistance or TEA provides TANF (Temporary Assistance to Needy Families) benefits. The benefits aim to help families return to work and become economically self-sufficient. To be eligible you must qualify as low-income and take care of a child under 18 years old. Over the past few decades, TANF benefits in most states have slipped significantly because of failure to keep up with higher costs of living. And the monthly benefit levels in Arkansas are already among the lowest in the country. TANF is a primary safety net for low-income families, but fewer and fewer people are able to rely on TANF and those who do are seeing their benefits dwindle. Arkansas had about 13,000 families who received TANF benefits in 2014.30 The most recent data from the Office of Family Assistance reports that the majority of children receiving TANF benefits are 5 and younger (51.7 percent). African American families represent 51.4 percent of TANF active cases and white families represent 40.6 percent. Arkansas has a lot of flexibility when it comes to how we can spend state and federal TANF funds, but the share of TANF funds that go to core welfare reform activities has been steadily declining. For example, the share of TANF funds spent on child care fell from 18 percent in 2001 to just 5 percent in 2013. Additionally, the share of TANF funds spent on basic assistance for families was almost three times higher in 2001 than in 2013. This is particularly concerning because the federal TANF block grant has lost a third of its real value since 1997 (because there have been no adjustments for inflation). Much of the “other” TANF funds are spent on good and worthy programs. However, these programs should not come at the cost of providing family safety nets, helping people find work, and providing quality child care to low-income working families. There were two major wins for family nutrition in our state this year: the Arkansas Meals for Achievement program was continued and the Community Eligibility program became more appealing to Arkansas school districts. The Arkansas Meals for Achievement program was started in 2013 and reauthorized in 2015. This program encourages schools to serve free breakfasts to all students as a part of the school day. Since 2013, there has been a huge increase in breakfast participation. The pilot program is designed to prove that positive results, like increased attendance and math scores, come from making sure kids aren’t hungry at school. Nearby states have already done a lot to adopt Community Eligibility. Oklahoma City started providing free school meals in 2014. Community Eligibility is a USDA program that was piloted and then became available to all districts in the 2014/2015 school year. The program allows schools with high rates of low-income children to serve free breakfast and lunch to all students instead of collecting school meal applications from individual students one-by-one. This option reduces stigma, increases participation, reduces administrative costs, and helps encourage a healthier student body. Until recently, many Arkansas school districts were hesitant to apply because of perceived conflicts with their NSLA funding (which is based on the income paperwork that is related to the Community Eligibility option). In 2015, the statute language was tweaked to give more confidence to districts that their NSLA funding would not be impacted. More districts are adopting the Community Eligibility option because of this change. That means more kids in Arkansas schools will be thinking about school instead of being hungry. The Supplemental Nutrition Assistance Program (SNAP) is another important tool for fighting hunger in Arkansas. About 1 in 6 people in Arkansas participated in SNAP in 2014 (for a total of about 492,000 people) and SNAP kept 54,000 individuals out of poverty between 2009 and 2012. SNAP helps fight hunger and “food insecurity”, when families cannot always afford to meet the nutritional needs of their families. Approximately 21.2 percent of Arkansas households struggled to provide complete, healthy meals to their families in 2013. Jeff Bridges (spokesperson for No Kid Hungry campaign) joins former Governor Beebe to speak on why breakfast programs are so important in Arkansas. SNAP benefits are determined by a sliding scale that depends on income and family size. Larger families, or families with very low incomes, receive more benefits because they need more help providing a nutritious diet. SNAP families with children got about $406 a month in benefits in 2013. On average, families receive about $1.24 per person per meal to help them afford basic food needs. Paid family leave is a wonderful way to help working families, but it is rare, especially among low-income workers. Only 13 percent of employees in the U.S. have jobs that allow them to take paid family leave. About half of first-time mothers don’t take any form of paid leave around the time of their pregnancy, and the most common reason for not taking leave is not being able to afford the drop in income. The U.S. is the only advanced industrialized country that doesn’t provide paid maternity leave for new mothers, and unlike some states, Arkansas also has no paid family leave program.34 We shouldn’t put kids at risk just because their parents can’t afford to take time off of work. Parents who keep more of their paychecks through a state-level Earned Income Tax Credit (EITC). A household that stays financially stable because of Temporary Assistance for Needy Families (TANF) supports that keep up with rising prices. Healthy food from the Supplemental Nutrition Assistance Program (SNAP) and from increased school participation in Community Eligibility. #ARKidsNeed Us To Work Together! Strong coordination between and among the supports for health, education and family economics will allow us to provide stronger support and will allow us to know what’s working well for our families and our state. Below are some examples of where things are working in coordination and where we need to improve. Partnerships to coordinate the identification and delivery of health care services with early learning programs. Participation of families, providers, schools and communities in federal nutrition and assistance programs. Voluntary, evidence-based, home visiting programs for new and expectant families at risk for poor child outcomes. Timely and ongoing prenatal, pediatric, and oral health care. Various public and private services that target low-income families frequently operate in silos; Arkansas lacks coordination. For example, TANF funds the Boys and Girls Club, which serves at risk and low-income youth, but there is little coordination between the two groups. TANF funds and monitors the Boys and Girls Club, and receives reports, but they do not coordinate all of the services provided to families through TANF. Another solution for overall coordination of support is for Arkansas to set up a centralized web portal or call center to let families know who does what and when they do it. Right now, unless parents already know about a program, it is unlikely that they will find it, let alone determine if they qualify or would benefit from it. Parents need to know about every public and private agency in Arkansas that serves families in their areas. This information could be categorized by groups (i.e. kids, seniors, or veterans), so that it can help link vulnerable Arkansans to the services that are designed to support them. Now is the time for Arkansas policymakers to act on the decades of research that indicates the importance of child development in the early years. We need a comprehensive strategy for promoting healthy development of kids from birth to 8. When making tough state budget choices, it is important to keep in mind the critical nature of this age group and make sure it is a top priority for the state. From pre-K to nutrition support to prenatal care, Arkansas has so many opportunities to build on the supports our youngsters need to be healthy and learning. 3 Arkansas Department of Human Services. (2014). Arkansas Medicaid Program Overview SFY 2014. 4 Arkansas Advocates for Children and Families. (2015). Arkansas’s Private Option Works for Families and Our Economy. Retrieved from: http://www.aradvocates.org/publications/arkansass-private-option-works-for-families-and-our-economy/. 5 Arkansas Department of Human Services (2015). Health Care Independence Program Data. 6 Andews, Michelle. Kaiser Health News. (2014). Rate of Premature Births Falls As Health Law Provisions Begin to Take Effect. Retrieved from http://khn.org/news/rate-of-premature-births-fall-as-health-law-provisions-begin-to-take-effect/. 7 Tout et al. (2013). The Research Base for Birth through Age Eight State Policy Framework. Retrieved from http://www.childtrends.org/wp-content/uploads/2013/10/2013-42AllianceBirthto81.pdf. 8 Centers for Disease Control. (2012). State of Arkansas. Retrieved from http://www.cdc.gov/nchs/pressroom/states/AR_2014.pdf. 9 Immunizations-Children United States. America’s Health Rankings: United Health Foundation. http://www.americashealthrankings.org/ALL/Immunize. 10 Freidman-Kass, A. & Barnett, W.S. (2013). Early Childhood Education: Pathways to Better Health Preschool Policy Brief, 25. New Brunswick, NJ: National Institute of Early Education Research. 11 Arkansas Department of Health. (2013) The Burden of Oral Disease in Arkansas. Retrieved from: http://www.healthy.arkansas.gov/programsservices/oralhealth/documents/oralhealtharkansas.pdf. 12 Palmer, Craig. (2010). CDC reports increased access to fluoridated Water. American Dental Association. Retrieved from CDC reports increased access to fluoridated water. 13 Natural Wonders Council. (2014). Natural Wonders: The State of Children’s Health in Arkansas. Arkansas Children’s Hospital: Retrieved from: http://www.archildrens.org/documents/2014_natural-wonders_web.pdf. 14 “Key Concepts: Brain Architecture.” Harvard University Center on the Developing Child (2015). Retrieved from: http://developingchild.harvard.edu/key_concepts/brain_architecture/. 15 Conners-Burrow., N.A. Fussell, J., Johnson, DL, McKelvery, L., Whilteside-Mansell, L., Bokony, P., Kraleti, S. (2013) Maternal Low and High Depressive Symptoms and Safety Concerns for Low Income Preschool Children. Clinical Pediatrics. 52(2) 167-173. Retrieved from: http://pediatrics.aappublications.org/content/113/6/e523.full.pdf+html. 16 Children’s Behavioral Health Care Commission.(2013). Annual Report to the Governor. Arkansas Department of Human Services. 17 Arkansas’ Strategic Plan for Early Childhood Mental Health. Available at: http://www.aradvocates.org/publications/summary-of-arkansass-strategic-plan-for-early-childhood-mental-health/. 18 U.S. Department of Health and Human Services, Office of the Assistant Secretary for Planning and Evaluation. (2001). On their own terms: Supporting kinship care outside of TANF and foster care. Washington, DC. 19 Child Trend. (2013). The Research Base for Birth Through Age eight Sate Policy Framework. Retrieved from: http://www.childtrends.org/wp-content/uploads/2013/10/2013-42AllianceBirthto8.pdf. 22 Population Reference Bureau, analysis of data from the U.S. Census Bureau, 2005 through 2012 American Community Survey. 32 Ruhm, C. J. (2000). Parental leave and child health. Journal of Health Economics, 19(6), 931-960. 35 Patient-Center Medical Home. (2015). Arkansas Center for Health Improvement. Retrieved from: http://www.achi.net/Content/Documents/ResourceRenderer.ashx?ID=277.